King of Judea, eldest son of John Hyrcanus; born about 140 B.C. ; died 104. He succeeded his father in the office of high priest, while his mother (or, according to Wellhausen, his stepmother) was, by the will of his father, to rule as queen. Immediately after the death of his father, Aristobulus threw his mother into prison, where she was starved to death; and to secure himself against further danger from his family, he imprisoned three of his brothers. Then he ascended the throne, and became the first Jewish king after the Babylonian exile—an interval of nearly five hundred years. Aristobulus was not content with the mere title of king, but endeavored, in the brief period of his reign, to prove himself worthy of his position. He made war on Iturea, subjugated a large portion of the people, strove to convert them to Judaism, and forced circumcision upon them. This fact, which Josephus derives from Timogenes, a heathen writer, admits of no doubt, although it is not known exactly what territory of the Itureans was conquered for Judea by Aristobulus. Successful as was his public career, Aristobulus was extremely unfortunate in his family relations. Being of feeble health, he gradually came under the complete control of a clique, at the head of which stood Alexandra Salome, the queen. Through its machinations, he was led to suspect his favorite brother, Antigonus—whom he had entrusted with a share in the government, and whom he treated almost as a coregent—of designs against him, and was finally induced to order his execution, though unwittingly, it is claimed. After this deed Aristobulus is said to have been seized with such bitter remorse at having caused the death of his mother and brother, that he broke down completely and died of grief, 104 B.C. If the account of Josephus concerning the family history be true, Aristobulus is the darkest figure in the Hasmonean dynasty; but not much credence can be attached to this portion of his narrative, by reason of the amount of legend that has gathered about it. 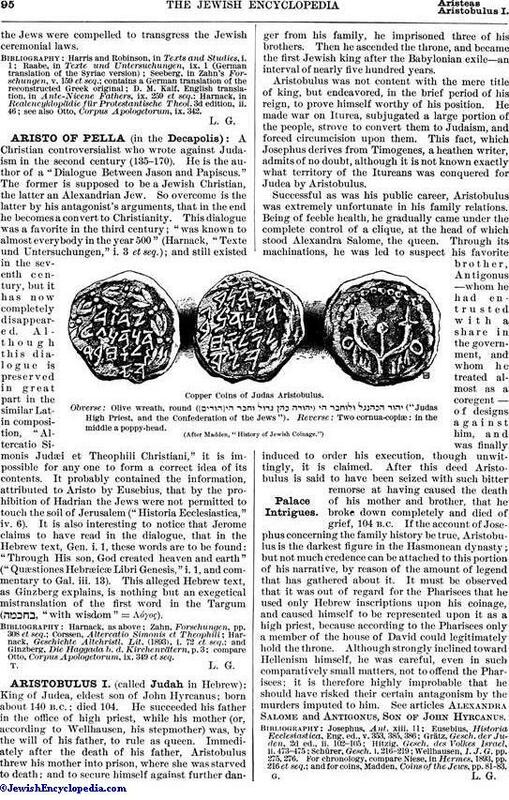 It must be observed that it was out of regard for the Pharisees that he used only Hebrew inscriptions upon his coinage, and caused himself to be represented upon it as a high priest, because according to the Pharisees only a member of the house of David could legitimately hold the throne. Although strongly inclined toward Hellenism himself, he was careful, even in such comparatively small matters, not to offend the Pharisees; it is therefore highly improbable that he should have risked their certain antagonism by the murders imputed to him. See articles Alexandra Salome and Antigonus, Son of John Hyrcanus. Copper Coins of Judas Aristobulus. Obverse: Olive wreath, round ( ("Judas High Priest, and the Confederation of the Jews"). Reverse: Two cornua-copiæ: in the middle a poppy-head. Wellhausen, I. J. G. pp. 275, 276.
and for coins, Madden, Coins of the Jews, pp. 81-83.